Day 36: Passing through Hannibal, MO. continue paddling down the Mississippi River. Photo: Mark Geerlings. GRAND RAPIDS, MI — It was late September when Gary and Linda De Kock arrived by kayak at Mile Zero on the Mississippi River. The couple gazed at the signpost with relish and dismay. Seventy days had passed — 2,291 river miles — since they launched on The Big Muddy’s Minnesota headwaters. The De Kocks had reached the end of their Mississippi River voyage, a journey to raise money for a good cause. 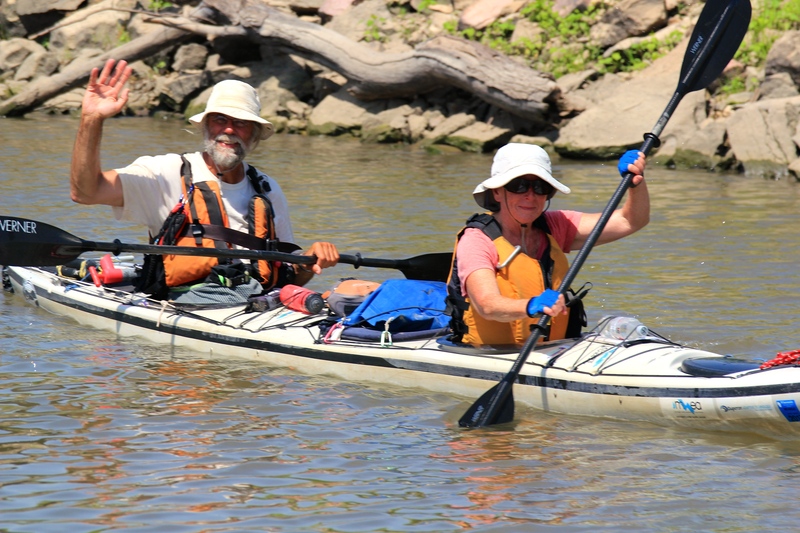 It was the conclusion of grand adventure for the Grand Rapids couple, who previously backpacked in Greenland, kayaked off Baffin Island and now had celebrated their 42nd wedding anniversary, camping on the Mississippi’s banks. The Mississippi River passes through 10 states and empties into the Gulf of Mexico. Gary De Kock, a retired Grand Rapids wastewater treatment plant supervisor, was contemplating something else. 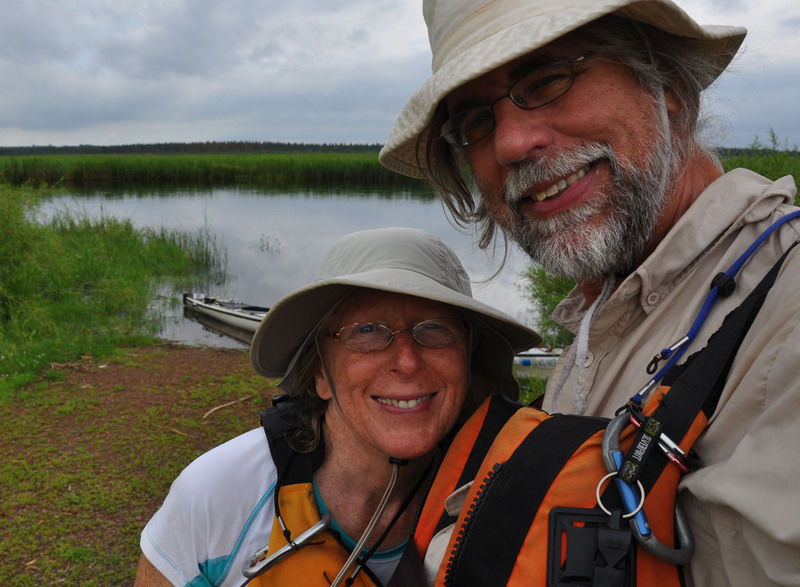 Day 7 near Grand Rapids, MN, the De Kocks shoot a selfie with the narrow river waters behind them. Photo: Gary De Kock. The De Kocks successfully raised $16,500 for Water for People, a nonprofit based in Denver that provides clean and safe water to villages in Third World countries. Their original goal was $11,455 — $5 for each mile paddled. For Gary De Kock, who spent his 30-year career providing West Michigan residents with clean water, helping Water for People was a natural progression. 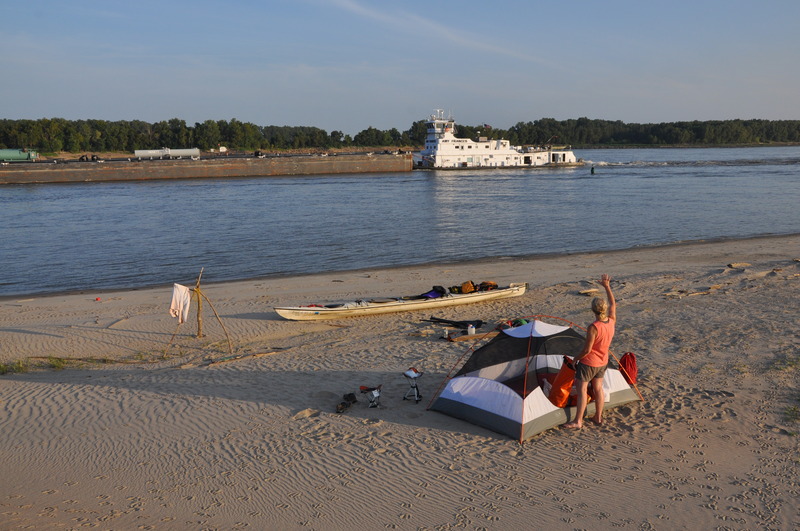 Seventy days on a river, spent camping on hot sand bars, islands and other odd, sheltered spots — or navigating its waters amid the tugs and barges, while floating through metropolitan areas like St. Louis, Missouri — presented more than a few challenges. The pair averaged 33 miles a day in their 22-foot-long double kayak, but the going could be slow on the Upper Mississippi, which began as a stream not much wider than their boat. The De Kocks launched July 19 at Lake Itasca, in Minnesota. They spent their first three days paddling narrow waters that steadily grew wider. The Mississippi is the second longest river in the U.S., after the Missouri River. It passes through 10 states and gains volume as it flows south, growing to 11 miles wide at Lake Winnibigoshish, near Bena, Minnesota. The river’s current picks up speed as it heads south, from 1.2 mph in the headwaters to nearly 3 mph at New Orleans, having picked up water from major tributaries such as the Ohio and Missouri rivers. Day 48: While camped on the banks just south of Carutherville, MO, the crew of the upriver-bound Amy Francis blow the ship’s horn in greeting and come out and wave. Linda De Kock waves back. Photo: Gary De DeKock. Its uppermost stretches required portaging around 10 dams — and negotiating a half-dozen or more log jams, the De Kocks said. 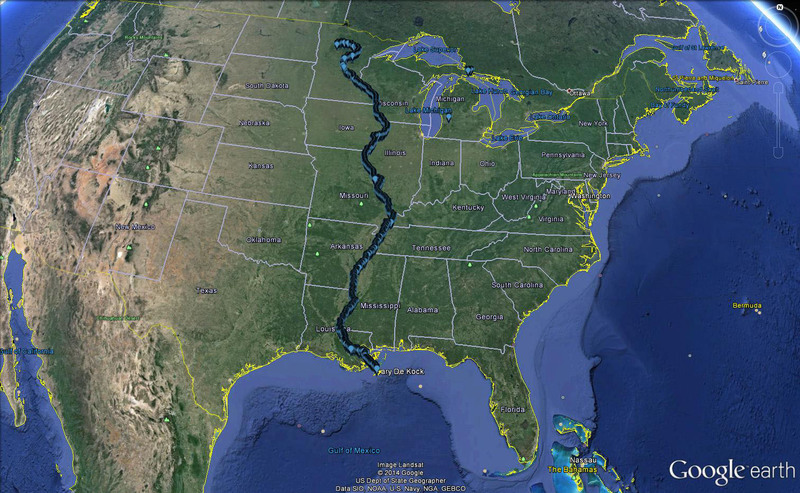 Once they reached Minneapolis, the couple could paddle through locks to get around various waterfalls and dams. Their longest portage was nearly a mile. It required rolling their 90-pound kayak through a town, a job made easier with a portable set of wheels. 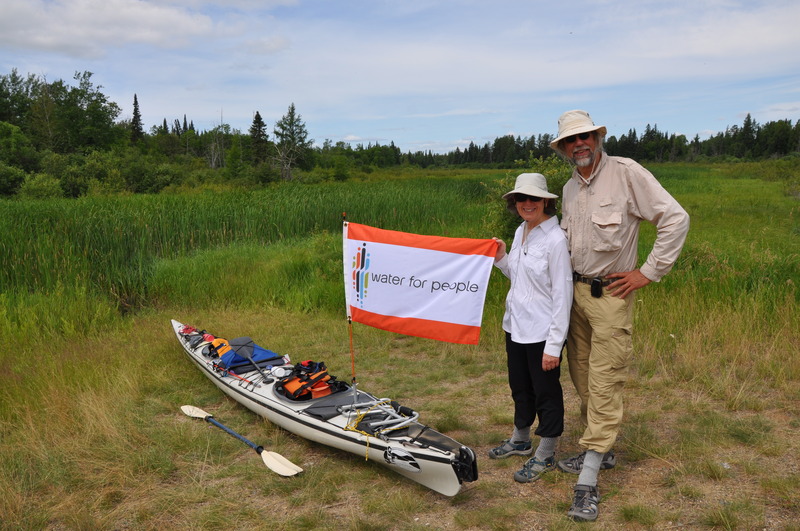 Day 1: Gary and Linda display their Water for People flat before launching on the narrow Mississippi River headwaters at Itasca State Park in Minnesota. Photo: Alisun De Kock. Long paddling days also were required. Daytime temperatures were warm, and the bugs on shore were miserable, both said. The couple planned to be in New Orleans by Sept. 27, the opening day for the Water Environment Federation’s national conference, where Water for People would be featured. Headwinds on the lower river sometimes were brutal and forced the couple back to shore. Fresh drinking water also could be a challenge to find. The De Kocks consumed about two gallons each day and replenished along the way by drawing from taps where they could. Linda said she grew tired of eating instant oatmeal for breakfast every day and will plan to have more food packed and available along the route if they attempt it again. 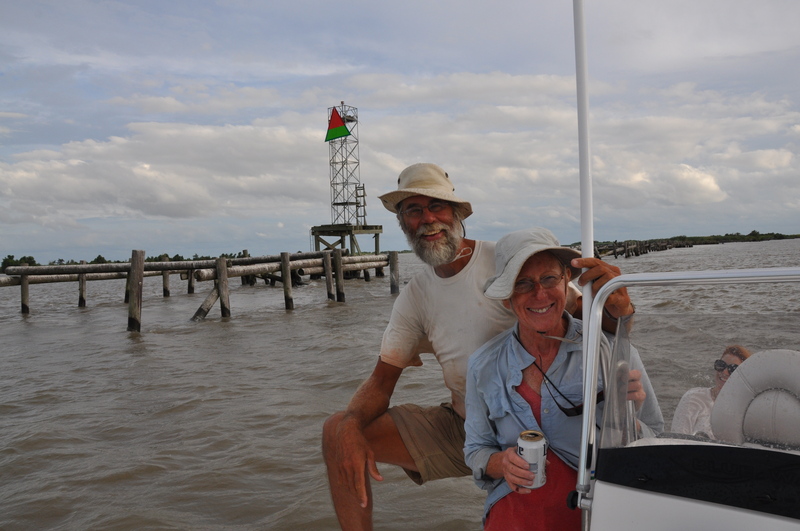 Day 70: Returning upstream on the river guide’s boat, the DeKock’s smile and enjoy their first beer in 70 days as they pass the red over green day marker, a coast guard navigation aid marking the channel leading to the Gulf of Mexico, just upstream from the Mile Zero marker. Photo: Alisun De Kock. Alisun. She had driven from Chicago with a friend and climbed aboard a river guide’s boat that had been chartered by the De Kocks for the nine-mile trip back upstream to port. “It was an epic journey,” Gary declared, adding that it was not without its challenges. This entry was posted in Uncategorized and tagged Adventure Travel, Camping, Environment, Kayaking, Mississippi River, Nature, Paddling, Rivers. Bookmark the permalink.